Due to an illness, I did not make it to GEARS this year, a great disappointment to me. Needless to say, I was not able to take any pictures, but through the kindness and generosity of Carole Felty, I have been able to make up this Gallery of photos. Carole and I have a different way of taking photos. She takes "PEOPLE" and I take "ENGINES," but without Carole there would be NO gallery at all. Many thanks for all these photos Carole. 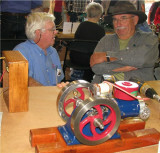 Late addition, Rex sent me several photos of the Casting area and Fred Bertsche sent me 15 photos of engines. Several others have send me identification and clarification of many of the photos. 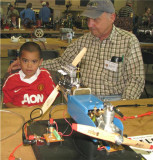 Orrin Iseminger has been very helpful with extra engine pictures and display information. 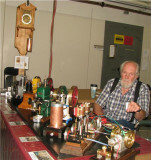 Richard Williams has also helped as well as several exhibitors. Thanks to all for their input. I am gradually incorporating all these additions and changes to the Gallery. Hope you enjoy the results! 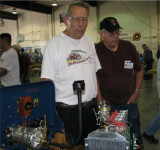 (15) Dave Palmer's really pristine 3 cylinder steam "Coventry"
(26) Rex, Alan and Jarod, the team that makes it all work! 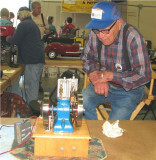 (40) Earl Wilms with his Mery Explosive engine. (52) Quilters #3. Cathy Iseminger making a face! 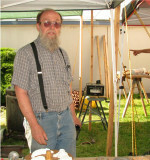 (57) Carl Felty, Jim and Bill take a little R&R time! 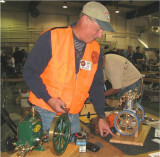 (58) Daniel Thompson putters with his engines. (60) Dennis Cullen (L), Bob Kipp (C) and Earl Wilms (R) solving some of the world's problems! 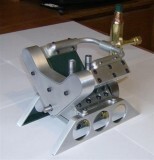 (64) Aaah, a sale by Little Machine Shop! (97) a little closer look at that workmanship! 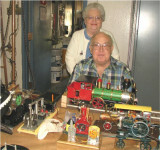 (98) Carl Felty by his table of great engines! 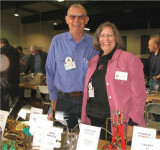 (100) Carl and Carole Felty at their display. 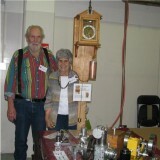 (101) Carl and Carole Felty in front of their clock. (103) Dwight Giles and his "big guns"
(152) Karl Smith with his 1910 OLDS Type A. 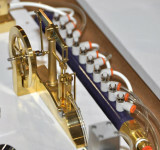 (157) Tom Stuart's Fairbanks Morse, type "N"
Thank you so much for all the skill, time and effort you put into this gallery of GEARS 2010. THe captions are also much appreciated.